Many people in MPA teach activities that require control of the musco-skeletal system. It is helpful for students to understand how the skeletal and muscle systems are affected by their positioning and posture. There are two apps available to help students gain a deeper understanding of these motor functions. 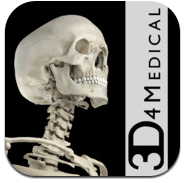 The app for the skeleton is free, the other costs approximately £1.30 (1.99 US). They also have a "Pro" muscle app costing £16.00 ($19.99 US).